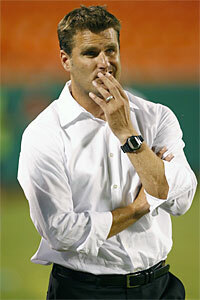 Curt Onalfo seems like a nice guy and it isn’t largely his fault for United’s disastrous season. But still he deserves a good chunk of blame. Yes United have been hit with injuries. Yes in many ways this was always a rebuilding year for them. Yes they got unlucky with some late goals and blunders. But this team should not be this bad. If being the worst team in the league isn’t enough to get you canned I am not sure what is. Steve Goff described a source that said this is a “panicky” decision. Perhaps. But United should be panicking. Something had to be done and firing a manager that had really done nothing to inspire confidence that he could get this team playing well made this pretty clearly warranted. In many games this year United found ways to lose without being outplayed on the field. They were not defensively strong enough to eke out draws or hold on to leads – often giving up late goals. Yet they were not offensively potent to push the game. Onalfo never found a balance between these two and DC often looked tactically confused. Against Salt Lake on Saturday, DC controlled possession for large stretches but seemed a bit tactically clueless in how to launch an attack. Yes Troy Perkins was calamitous in not making the save on the first goal, but prior to that RSL every time they got the ball looked dangerous. This is not a team devoid of talent. It is a team seemingly devoid of ideas and that is not solely down to the lack of a playmaker. The lack of goals scored this year is not just down to an ineffective strike force, it is a collective failing. In Santino Quaranta, Chris Pontius, Clyde Simms, and now Andy Najar there is a good nucleus. Yes the injuries took a real toll, but in the last couple months United looked like they had the potential to turn it around as players came back and some new players emerged. But they never did. Instead, the cycle of losing continued, and when you get in such a downward cycle a change has to be made. Onalfo was never the team’s top choice – they wanted Akron manager Caleb Porter who turned them down – and faced with no manager late in the process Onalfo was the best available. Given that, I think United gave Onalfo plenty of time and he couldn’t find a way. What made the change easier is Ben Olsen. No one knows if he will be a good manager or tactician. But the guy is a legend with the club and with the season all but over this is a great opportunity to hand him the keys to see what he can do. If he does well and United play more inspired football, DC has there manager, if not, back to the drawing board.